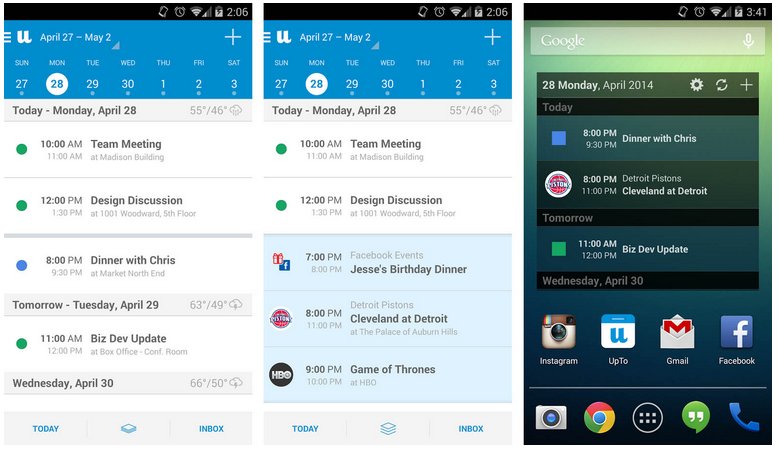 UpTo Calendar received a major update on Android today, bringing it inline with its iOS counterpart and taking it from Android widget to full-blown calendar app with multiple layers. We have had the pleasure of testing the new app for a couple of weeks now and can emphatically say that this calendar app is awesome. First, you have the UI that is both beautiful and functional. There is the Android-inspired hamburger menu to the left that can be reached with a swipe, a scrollable calendar list with moving day indicator as you move up and down your list of appointments. You can change to daily, weekly, monthly, or Agenda views, check your inbox for calendar requests, and of course, quickly add new calendar items. But these are all just your regular calendar fixins’, what else can UpTo do? The layer aspect of UpTo is what makes it great in my opinion. Your top layer is your typical calendar. The secondary layer makes UpTo both social and customizable to you. Let me try and explain that. If you swipe out the menu in UpTo, you will see a “Discover” option, which is a list of hundreds of public calendars that you can subscribe to. These can be anything from the Portland Trail Blazers schedule to the NBA Playoffs to Game of Thrones reminders to reddit AMAs to music or movie releases. You can take your calendar as it is, but then add a layer of reminders for some of your favorite things. If that sounds like your calendar will become overwhelming, think again about this layer idea. Since these subscribed-to layers sit in the background, you can have them hide from sight until you need them. A simple pinch-to-zoom on your calendar will either hide or show the contents of your secondary layer. Brilliant, right? UpTo is also social. In other words, you can follow friends’ calendars, share items with them quickly (swipe an item to the left to reveal the button), and build up a network within the app. Oh, and the widget is still there too. Give it a look if you want a new calendar experience.